Water moving at 25 mph has the pressure equivalent of wind blowing at 790 mph — greater than the speed of sound. No surprise, then, that a sewer geyser has the power to lift a Ford Focus right off the pavement. 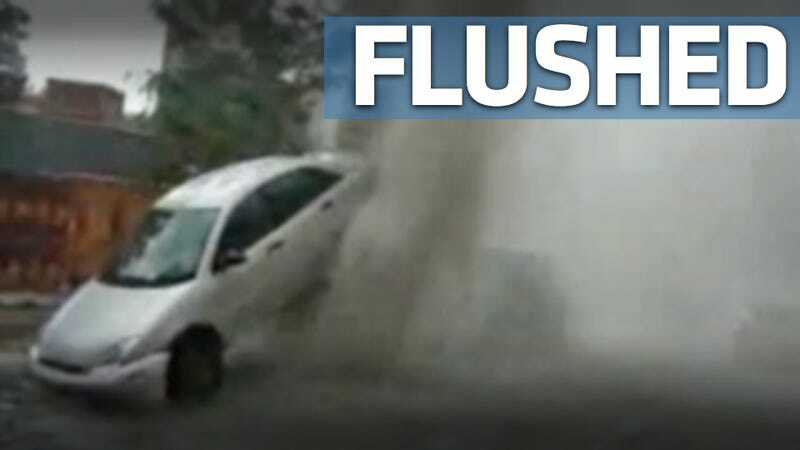 Caught by a bystander in Montreal, the explosive force of the sewer spout not only lifts the car, but it also tears the crap out of its rear section, which takes the brunt of the gusher's ponderous discharge. Uh, yeah. Also, props to the cameraman for not running the hell away from that mess.